The tiara vaults of the grand ducal family of Luxembourg are massive, but a number of those diadems are remarkably petite. 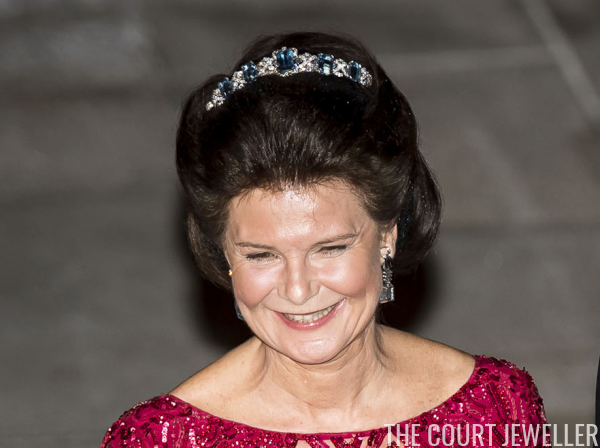 Today's tiara -- one of the grand ducal family's many twentieth-century jewel treasures -- is one of these smaller sparklers, a bandeau made of diamonds and aquamarines. The piece is made of large aquamarines interspersed with crisscrossed rows of diamonds. It was made as a part of a demi-parure of aquamarine jewels for the late Grand Duchess Joséphine-Charlotte; the set also includes earrings and a necklace. Joséphine-Charlotte was photographed wearing the bandeau low across her forehead, just as her mother, Queen Astrid of the Belgians, once wore her bandeaux. Marie-Astrid, Joséphine-Charlotte’s daughter, was also pictured wearing the aquamarine bandeau in this manner. Other members of the family have chosen to wear the tiara more traditionally. 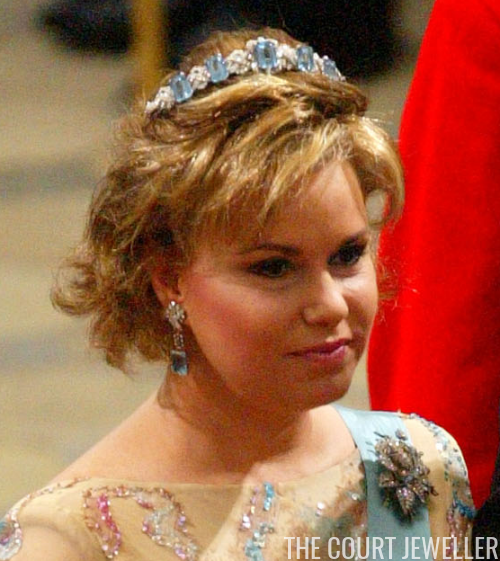 The current grand duchess, Maria Teresa, has worn the tiara on multiple occasions, including at the glittering wedding of Crown Prince Frederik of Denmark in 2004. Princess Margaretha of Liechtenstein (née of Luxembourg) wore her mother’s aquamarine set at another major wedding: that of the grand duchy’s future reigning couple, Hereditary Grand Duke Guillaume and Hereditary Grand Duchess Stéphanie, in 2012. As the Hereditary Grand Duchess has been steadily working her way through the many tiaras in the Nassau family vaults, I think it's only a matter of time before we see her wearing the tiara, too.